“Old New York” means different things to different people. For some, it literally means whichever restaurants and bars have been open the longest. But for others, it means old-school places that capture a certain feel -- a Cole Porter on the playlist, customers in black tie, Art Deco-everything kind of feel. Those are the places we’re discussing here. Each has its own history, but, most importantly, they all have liquor. Get ready to get transported to the ‘20s. 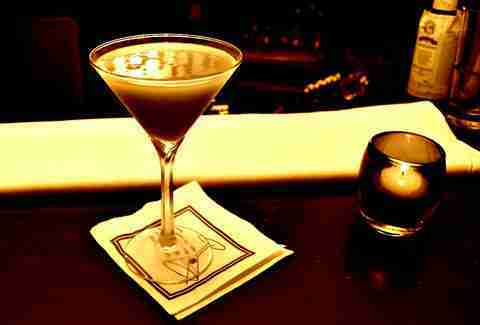 New York is rife with “speakeasies” that opened in 2011, but 21 Club can truly claim the title. Prior to its official opening in 1930, the club survived Prohibition with a secret wine cellar and disappearing bar that, through a system of levers, actually disappeared when the feds came to raid 21. 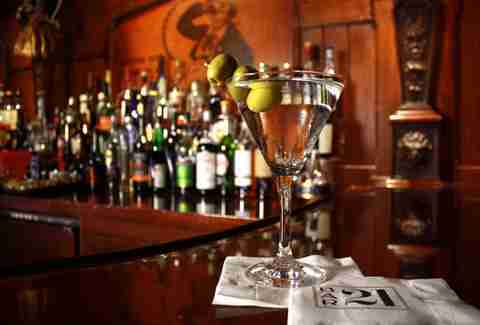 That’s the kind of ingenuity that makes a place famous, and sure enough, 21 Club has attracted many wealthy and elite customers since it’s gone legit -- including noted party animal Nancy Reagan. You’ll know you’ve arrived at the right spot when you spy the line of jockeys (all gifts from Vanderbilts and Mellons) out front. 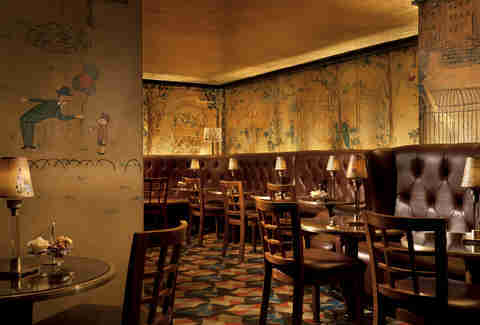 If it weren’t for all the alcohol, you could mistake Bemelmans for the world’s most lavish nursery. That’s because the walls and lampshades are covered with whimsical illustrations from Ludwig Bemelmans, the man behind Madeline. The bar now bills itself as “the only surviving Bemelmans commission open to the public,” but don’t come here with your kids on a Sunday afternoon. Instead, show up on Friday night in something sharp, saunter up to the black granite bar, order a single malt, and then gawk at the gold-leaf ceiling as the live jazz band plays on. 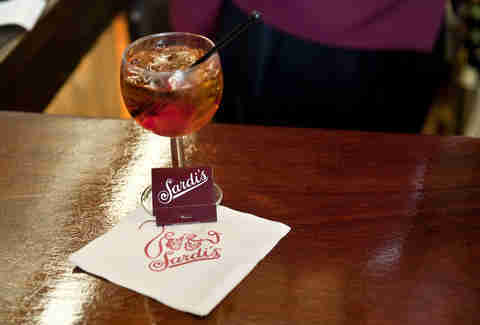 For many, the draw of Sardi’s is eating a nice Italian dinner before heading off to see Hamilton. (Or, more realistically, that Gloria Estefan musical.) But you can rub elbows with Broadway vets at the bar located on the second floor of the restaurant, which opened its doors in 1927. Sadly the free cheese is gone, but the beloved bartenders in bowties are still there. 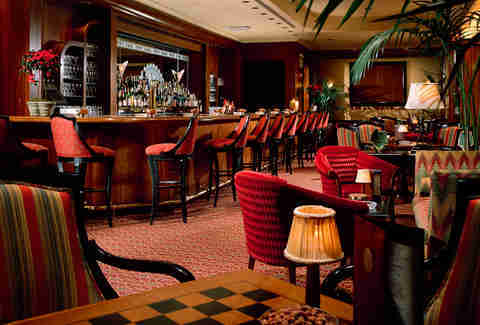 Named for the British explorer Sir Harry Johnston, this Waldorf Astoria lounge is a bit of a trailblazer itself. Sir Harry’s is the supposed birthplace of drinks like the Rob Roy and the Waldorf Sunset (gin, orange juice, creme de cacao, grenadine) which appear in the hotel’s legendary Old Waldorf Astoria Bar Book. Enjoy one of those in an armchair, so you can take in all the elegant wall sconce action. 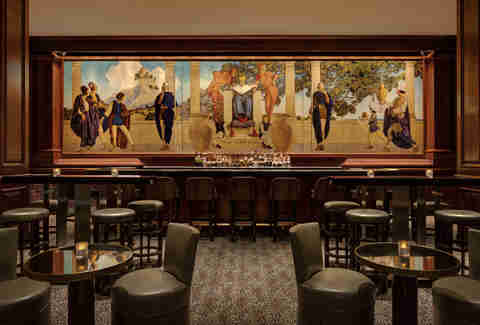 A bar that’s literally bathed in blue hues might not seem like the obvious choice for a “classic” New York experience. But this spot has a major advantage thanks to its home hotel’s associations with the famed literary gang of Dorothy Parker, Robert Benchley, Harold Ross, George S. Kaufman, and co. -- collectively known as the Algonquin Round Table. Once upon a time, they lunched at the Algonquin every day, and while it wasn’t in the Blue Bar specifically, the place tries to keep their vibes alive with Al Hirschfeld drawings on the walls, old school tunes, and stiff Sidecars. Drinking gin in the corner of Grand Central Station is normally frowned upon, unless you’re doing it in the ritzy Campbell Apartment, located off the Vanderbilt Ave entrance. 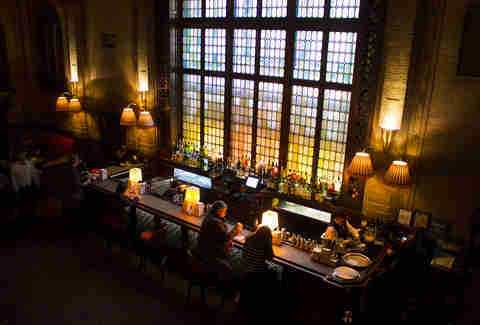 The bar itself is not old, but it was once the office of ‘20s mogul John Campbell and was restored twice, once in 1991, and again in 2006, to resemble that time. It's a fancy (as in, no T-shirts or Converse fancy) lounge with lots of rich mahogany and massive leaded glass windows held over from Mr. Campbell’s time. Each bar in The Plaza is swanky in its own way, but if you want to feel like vintage aristocracy, head to the Champagne Bar. Remodeled to resemble the OG 1907 iteration, the Champagne Bar is supposedly the “most exclusive” of the hotel’s offerings. We’d buy it, based on the caviar service, bartenders in white jackets, and hot cameos by the Prince of Wales. Walk straight up to the bar at this St. Regis Hotel watering hole and you can stare down King Cole himself. The name comes from an enormous mural of that sovereign and his loyal subjects that sits behind the shelves of booze, and it sets the tone for this very regal cocktail lounge. 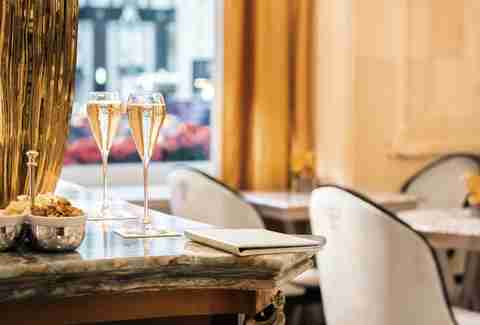 King Cole Bar has all the pricey cognacs and champagnes you’d expect, along with six different Bloody Marys, for a very special reason. Management claims it invented the drink in 1934, only they sold it (and continue to sell it) as the Red Snapper, so as not to offend the posh clientele. Make sure to order accordingly. 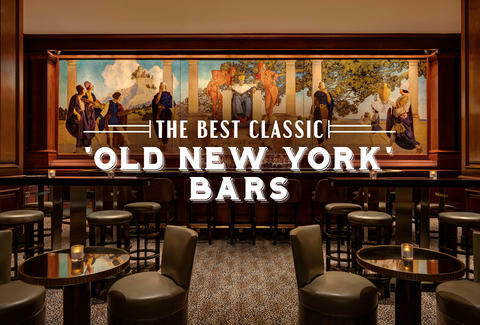 Rejoice, Metro North commuters, because there are actually two classy old bars in Grand Central. 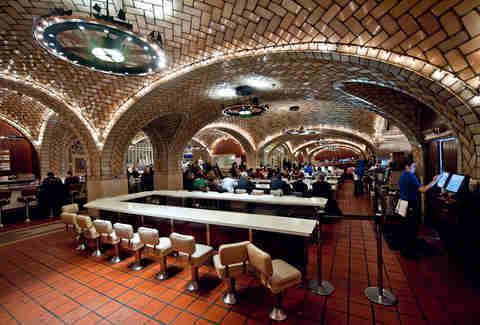 Since 1913, people have been dining under the Oyster Bar’s glimmery vaunted ceilings. And while the restaurant is great, if you weave your way through the main dining area, you’ll stumble upon a backroom marked “saloon.” Blow through those saloon doors to the dark wood-paneled den, where you can drink cheap martinis, snack on oyster crackers, and eavesdrop on modern-day Don Drapers delaying their trips home to Ossining. 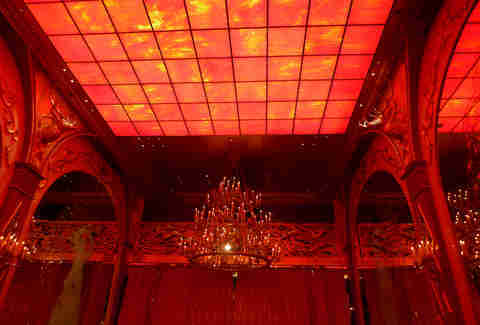 Asking someone to meet at the Russian Tea Room on any movie or TV show set in New York is shorthand for, “I am a very fancy and important person.” (Evidence here and here.) It’s easy to see why, considering the chandeliers and gold everything in this 88-year-old establishment, originally founded by members of the Russian Imperial Ballet. The place has an afternoon tea that’s been drawing tourists for decades, but if you’re not into darjeeling, don’t fret. True to its roots, the Russian Team Room has an entire 36-item vodka menu with the option for specialty flights, plus a cocktail list featuring originals like the Rasputin. Kristin Hunt is a freelance writer for Thrillist, and dreams of being Dorothy Parker about once a week. Follow her at @kristin_hunt.